After dinner, we decided to go for a walk — well, you cannot resist it anyway, as the streets are still so much alive, still many people around, but not busy walking like during the day, rather having a relaxing stroll, or chatting at the corner; many shops either open, or left the bright colourful lights on, giving the night London more colour; and many restaurants are filled with people — along with food smell. The lights and noise from everywhere is keeping night London from falling into sleep. I have not been in a mood for meat lately, actually, not at all. But suddenly one day, I began to long for this Chinese snack - dried beef. Dried beef is a very traditional Chinese snack, it is called ‘niu rou gan’ in Mandarin. In some packages with English title, it is sometimes translated as ‘beef jerky’. 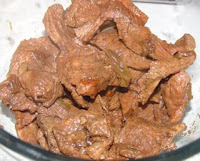 However, apart from the fact that they are both dried meat, the way of making it and the taste is very different. I think in my post about ‘Chinese snacks’ I already mentioned that ‘dried beef’ and ‘dried pork’ are quite popular in China. If you have some good Chinese friends, probably you have tried it already, because it is comparably pricy, especially those ‘fancy’ ones. Many Chinese people like to give it as a gift. However, many of my western friends, (including my husband) did not like it very much — it is mainly because nowadays the ‘fancy’ package makes it look like ‘sweets’, imagine when people are expecting to have a sweet in the mouth, but instead, it is a savory, and hard to chew, piece of meat. Ha… But I think when you let them know what they should expect, they would like it better. But I have to admit, since it is dried meat, it is a bit hard to chew, but this is where the fun is anyway. 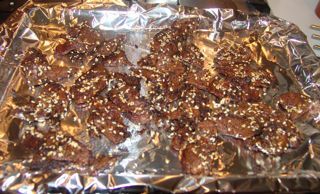 (Unlike beef jerky in slices, Chinese dried beef is normally thick or in cubes. It is not as easy to chew as beef jerky.) Because it has lots of tastes, as you chew it, you can slowly taste them all. — At least I like it very much. 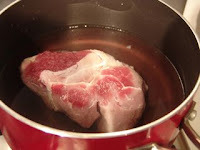 1) Put the beef chunk into boiling water, and briefly boil it for 3-5 minutes, for getting rid of the blood, not for cooking it. Alternatively, it can be soaked in cold water for around 2 hours. 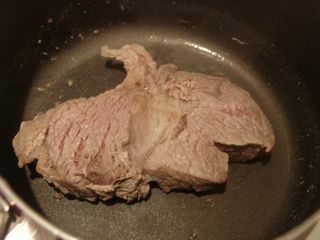 Then chop the beef into slice – no need to be very thin. 2) Chop the ginger, scallion (I used leeks) into pieces. There are three steps for making the dried beef. 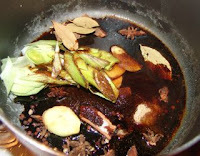 1) Add chopped ginger and scallion in the sauce pan, along with a small handful Sichuan peppercorn, 3 bay leaves, a few anise stars, couple of cinnamon sticks, 1/3 teaspoon of ground fennel seeds, 1/3 teaspoon of ground cardamon (optional), 1 teaspoon of salt, 1/4 cup of soy sauce, 1/2 cup of red wine or (around) 1/4 cup of cooking wine, 1/3 cup of brown sugar. 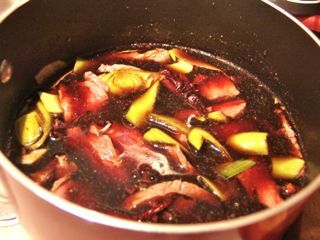 2) Add the chopped beef slices in the sauce pan, boil everything together for around 1 hour minutes with low fire. 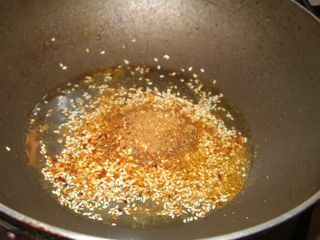 When oil is getting hot, add in 1 tablespoon of crushed chili, 2 tablespoons of toasted sesame seeds, and 1 tablespoon of ground cumin seeds. 2) Then add in boiled beef slices, keep on stir-frying them, until it gets dry inside the wok. (This normally takes around half an hour. Keep the fire medium to low fire, to allow the taste slowly getting into the beef. If you want to prepare it as a dish for dining table, you don’t have to do the next step. It can be served now. 1) Place stir-fried beef slices in pre-heated oven at around 150 degrees. It could take around 40 minutes or the surface of the beef is dry — but it all depends on how dry or hard you like it. 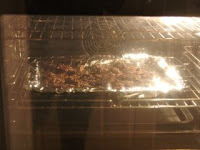 2) Once it is removed from the oven, it needs to cool down before keeping them in a sealed jar. It can be kept for at least 2 weeks. The longer you leave it outside, the drier and hard it gets. Chop the ginger and scallion into pieces. Add chopped ginger and scallion in the sauce pan, along with a small handful Sichuan peppercorn, 3 bay leaves, a few anise stars, couple of cinnamon sticks, ⅓ teaspoon of ground fennel seeds, ⅓ teaspoon of ground cardamon (optional), 1 teaspoon of salt, ¼ cup of soy sauce, ½ cup of red wine or (around) ¼ cup of cooking wine, ⅓ cup of brown sugar. Addbeef slices in the sauce pan, boil everything together for 1 hour with low fire. When oil is getting hot, add 1 tablespoon of crushed chili, 2 tablespoons of toasted sesame seeds, and 1 tablespoon of ground cumin seeds. Add in boiled beef slices, keep on stir-frying them, until it gets dry inside the wok. 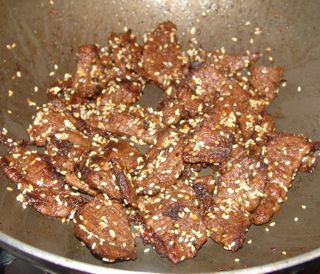 Place stir-fried beef slices in pre-heated oven at 150 degrees for 45 minutes. Once removed from the oven, it needs to cool down before keeping in a sealed jar. It can be kept for at least 2 weeks. The longer you leave it outside, the drier and hard it gets.